Introduction – This large village in Haveri district had population of 1340 in 1881, which grows to 5196 in 2011 census. It is referred as Nareyamgal in inscriptions. It appears as this village was set up as an agrahara (Brahmin settlement) with one thousand Brahmins associated with it. In many of its inscriptions reference of ‘Thousand of Nareyamgal’ is found which points to the community of thousand Brahmins (mahajanas). The earliest reference of the town is of the time of Rashtrakuta king Dhruva (780-793 CE). No mention of the Sarveshvara temple is made in it. Marakkarasa was said to be governing Banavasi-12000 under which Naregal was included. Next inscriptions were from the reign of the Western Chalukya king Vikramaditya VI (1076-1126 CE). During his time, Naregal was donated to Savaladevi, queen of the Kadamba chief Tailapa. Tailapa was said to be governing Banavasi-12000 and Panungal-500 (modern Hangal). A later inscription refer to the reign of the Suena king Ramachandra. This suggests that Naregal was under the Suenas after the fall of the Western Chalukyas. No Hoyasala and Vijayanagara inscriptions are found here. Few fifteenth century CE inscriptions are found here however no mention of any royal house is made in these. Inscriptions – There are eight inscriptions found in and around this village, there were published in the Annual Report on Indian Epigraphy for 1946-47. Slab on the tank-bund near the temple of Sarveshvara – Annual Report on Indian Epigraphy for 1946-47, no 227 – refers to the reign of the Western Chalukya king Tribhuvanamalladeva (Vikramaditya VI, 1076-1126 CE), ruling from Kalyana – not dated – Records the construction of the temple of Siva at Nareyamgal by Mahaprabhu Kappimayya, the foremost of the ‘Thousand’ of the place, when Mahamandalesvara Tailapa was governing Banavasi-12,000 and Panungal-500, and queen Savaladevi, the daughter of mandalesvara Jogama-Rana was ruling the agrahara Nareyamgal which she had obtained from the king for her personal enjoyment. Gives a poetic description of Banavasidesa and Nareyamgal. Also gives in detail the genealogy of Kappimayya and credits him with performing many charitable deeds. Another beam inside the temple of Sarvesvara – Annual Report on Indian Epigraphy for 1946-47, no 229 – refers to the reign of the Western Chalukya king [Tribhuvanamalladeva]- dated Chalukya Vikrama year 50, corresponding 1126 CE – Refers to the former gifts made on the first specified date by Kappimayya for the god Mulasthanadeva and registers certain gifts on a subsequent occasion by Govindadeva, son of Kappimayya, when Mayuravarman, son of Tailapa was governing. A slab in front of the temple of Horapet-Basavanna – Annual Report on Indian Epigraphy for 1946-47, no 232 – refers to the reign of the Yadava king Pratapachakravartin Vira-Ramadeva – dated in 3rd regnal year, corresponding 1273 CE – Registers gift of land by Joyisa Maduvayya to the temple of Kodiyadeva, made in the presence of the Pañcha¬matha and the One-Thousand of Nareyamgal. A pillar in the temple called Mannagudi or Mannabasappa – Annual Report on Indian Epigraphy for 1946-47, no 231 – Refers to a dispute for a share in the property (vritti) of the god Achalesvara of Nareyamgal and its settlement by the Mahajanas. A slab outside the temple of Sarvesvara – Annual Report on Indian Epigraphy for 1946-47, no 230 – States that the land belonged to Timmana Joyisa, son of Angana-Joyisa, of Sandalya-gotra, Rik-sakha and Asvalayana-sutra. In characters of about the 15th century CE. Slab on the road between the boundaries of Naregal and Kudla (survey Nos. 57 and 58) – Annual Report on Indian Epigraphy for 1946-47, no 233 – Mutilated. Seems to record grant of land, made to a private individual (name lost). In characters of about the 15th century CE. Sarveshvara Temple – This east facing temple is consisted to a mandapa, antarala and garbha-grha. The mandapa is supported on half-pillars rising from stone benches and has a slanted roof. The roof of the mandapa is supported on twenty-four pillars. It is provided with three entrance, one on east, north and south. There would have been a front porch on the eastern entrance which has not survived. An image of Saraswati is placed in this mandapa. There are two niches, on either side of the antarala doorway, in the mandapa. One has a naga-stone and one has small shivalingas. However, as per the regular arrangement, the left niche should have Ganesha and right niche should enshrine Mahishasura-mardini. 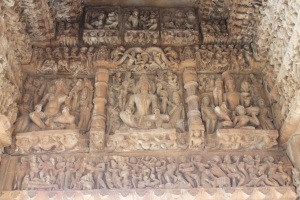 The antarala doorway lintel has Brahma, Shiva and Vishnu under a makara torana. Above the torana are shown Ashta-dikpalas. Garbha-grha doorway has Gaja-lakshmi on its lalata-bimba. No perforated windows are present on this doorway. Dvarpalas are placed at the door jambs. A Shiva-linga is enshrined inside. On the back wall on the sanctum is a deep niche, which probably is for installing the movable images of the temple. The external façade is devoid of any decoration. The shikhara of the temple has not survived. Few hero-stones are placed under a shed. Few loose sculptures are strewn around the temple. These consists Ganesha, Surya and a head of Buddha. As per an inscription (no 2 of this article), a temple of Shiva was constructed by Mahaprabhu Kappimaya, when Savaladevi, queen of Kadamba chief Tailapa, was ruling Naregal during the reign of the Western Chalukya king Vikramaditya VI (1076-1126 CE). The inscription does not mention the name of the temple and its present location is not in the temple but near the tank. However, it might be the foundation inscription of the Sarveshvara temple which at some later point of time was moved to the present location. Support for the above theory comes from an inscription, found inside the temple beam (no 4 of this article), which mentions Kappimayya, who would be the same Mahaprabhu Kappimayya mentioned in the above foundation inscription. If this is accepted, then it can be safely said that this temple was constructed during the Western Chalukya period. How to Reach – Naregal is 20 km NE of Hangal and 15 km from Haveri. Haveri and Hangal are connected to all major towns of Karnataka. Haveri is the nearest railhead.